The cowboys are here! Yesterday marked the start of the National Finals Rodeo, a 10-day extravaganza celebrating the best ranching skills on both the human and livestock sides. Only the top 15 compete in each of the seven events at this acme of rodeo. Tie-down roping, anyone? 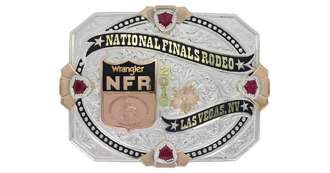 This is year 30 for the NFR Finals in Vegas. Remember that great final love scene at the NFR Finals in George Strait‘s movie, Pure Country? But I digress. There are free concerts after the competition all over town but I favor the South Point Hotel, Casino and Spa. The Dance Hall is the home of the nightly Buckle Ceremony, where the winners receive their hard-won victory buckles (see below). Flint Rasmussen, the best dancin’ clown in rodeo, and Randy Corley, a PRCA Announcer of the Year, give out the buckles. Ceremony starts at 11 p.m. and of course it’s FREE! But this is a two-fer. There is a FREE concert after the show. Because everyone dances at cowboy events. I should know since I spent 23 years in Dallas. How do you think I got my two first names? You need two first names to get a driver’s license in Texas. Just kidding. Oh, and Aaron Watson performs for FREE in The Showroom earlier in the evening, giving you something to do before the big shindig.